Established in 1864, The Harvard Club of Philadelphia is the second oldest alumni club in the country and serves the alumni, parents and students of Harvard University who live in the greater Philadelphia area. It offers opportunities for members to engage with the local Harvard community, keep up with events in Cambridge and support the Universtiy in the Philadelphia region. 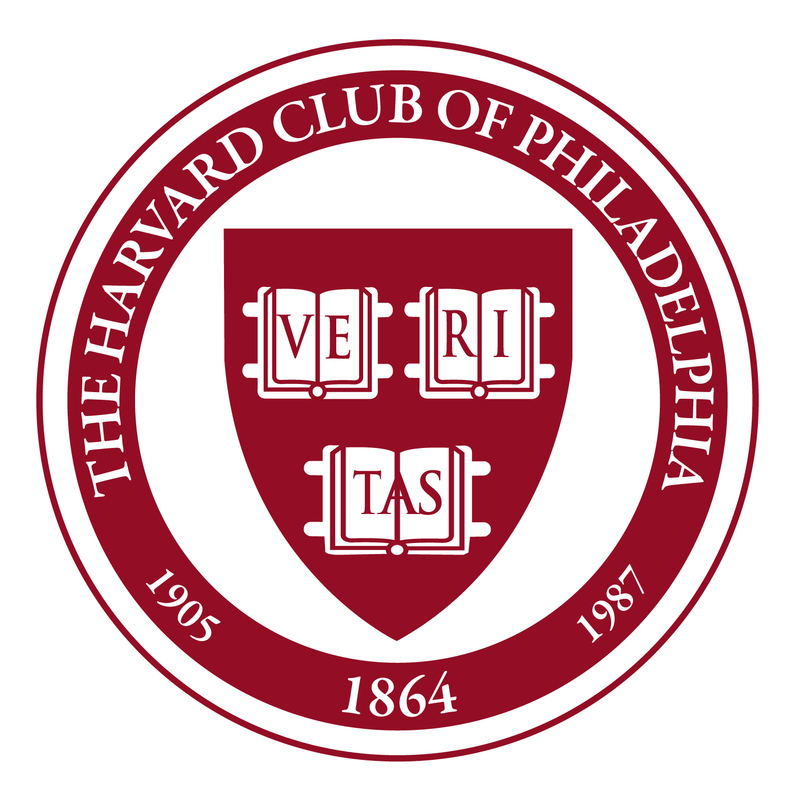 The dates in the club's logo recognize three milestones in the club's history - the initial founding of the Harvard Club of Philadelphia in 1864, the formation of the Radcliffe Club of Philadelphia, and the merger of the the two clubs in 1987. The Harvard-Radcliffe Club of Philadelphia is a 501(c)(7) non-profit organization. To make a donation to the club's scholarship fund, click here or Prize book program, click here. "All persons," the statement added, "having a degree from the University of Cambridge, and of an unobjectionable character, shall have the right to become a member of this society. The requirements have changed somewhat since then. In particular, the requirement of an “unobjectionable character” was dropped – much to the relief of the membership committee. Beginning in 1928, the Club has had club rooms at a number of different locations. Almost thirty years at the Bellevue were followed by short sojourns at the Belgrade and the St. James (until the ceiling caved in). For over a decade, the Club shared 1223 Locust Street with the Princeton and Yale Clubs. With those clubs, it moved to rooms in the Rittenhouse Club in 1978. After another short period at the Art Alliance on Rittenhouse Square, it entered into its present arrangement at the Acorn Club at 1515 Locust Street. Throughout the 150 years of its existence, the Club has remained firmly committed to a service function. The contribution in which our members take perhaps the greatest satisfaction is the work of the Schools Committee. This dedicated committee interviews all applicants to Harvard Radcliffe from this area and promotes communication between the Admissions Office and Philadelphia area schools. Other significant activities of the Club include: a series of luncheon programs with outstanding speakers, appropriate festivities before the Penn and Princeton games, sponsorship of undergraduate groups when they come to Philadelphia, receptions for newly-admitted students and/or applicants, and the Annual Dinner. The Harvard Club of Philadelphia Scholarship Fund, an endowed fund established in the early 1900's and managed by the University, is supplemented by annual contributions from members. Income from these sources enables the University to provide scholarship support to undergraduates from the Philadelphia area. The Radcliffe Club of Philadelphia was founded in 1905 with three chartered purposes: to raise funds for scholarships, to assist alumnae in maintaining contact with college activities and developments, and to provide regular meetings to foster friendships among alumnae. To these ends, the Club held scholarship benefits, supported an active Schools Committee, and provided programs on a wide variety of intellectual, social, and cultural topics. In 1987, the Harvard and Radcliffe Clubs merged to from the Harvard-Radcliffe Club of Philadelphia. In the intervening decade, the two Clubs' schools, scholarship and programs functions were combined and the unified Club was fortunate to enjoy excellent leadership by both Harvard and Radcliffe graduates. On October 1, 1999, Radcliffe College and Harvard University officially merged with Radcliffe College evolving into the Radcliffe Institute for Advanced Study at Harvard. In 2017, the Club reassumed the name "Harvard Club of Philadelphia" to reflect the merger of the two instiutions and clarify the its role as the club for all alumni of the University.